this my first mod project...it uses assets from multiple modders.i made some simple tweaks. bulkened up the armor, made some simple color changes, stuff like these. god bless dragbody, without his fo4 port i couldnt get the pauldrons. can really use some help, especially with the textures. so why did i do this? 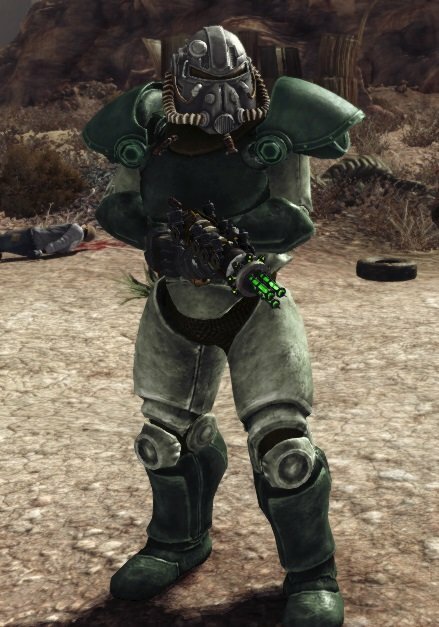 i love dragbody's work, i'm just not a big fan of fo4's futuristic looking power armors. this is a bulkier version of the standard t51b along with completely new pauldrons (directly copied from fo4 port). what i really want is to make super clean looking textures for the whole armor, same pattern, no need for details, but look at the pauldrons and the helmet. they are very clean looking. i want to replicate this for the rest of the armor. please contact me if you are willing to help.